Me: Happy Easter everyone! The Lord is risen! You know that the early Christians would greet each other that way on Easter morning? The first person would say, “The Lord is risen!” And the next person would say, “He is risen indeed!” And then they would both say, “Hallelujah!” Do you want to try it? I brought my friend, Baabara the Lamb, with me today. She said that she wanted to come to church today so that she could listen. She wants to listen to the music and songs. She wants to listen to the sermon. Baabara: And I want to listen to the “Hallelujahs.” You don’t often get to hear people say, “Hallelujah.” It’s a wonderful word. Can you say it again? Baabara: I know how to say “Hallelujah” in another language. I can say it in sheep language. Me: That’s right! Sheep-speak is your native tongue, isn’t it? Okay what is “Hallelujah” in Sheep-speak? Baabara: No… that sounds more like Goat-speak than Sheep-speak. It’s okay. I understand. You’re not a native speaker. Me: If I had gone to Lamb Kindergarten and grown up speaking sheep, I’m sure I would do a lot better. Baabara: Probably. Yeah. You’ve got to have an ear for language. It helps to be a good listener. Me: That’s true. Good listeners can learn new languages faster. By the way, the sermon today is about “Hearing Jesus.” Did you know that? Baabara: What does Jesus’ voice sound like? Me: Well, like the voice of a shepherd, I suppose. I’m sure that sheep can understand that. Jesus is the Good Shepherd, after all. Baabara: That makes sense. I am always happy to hear to hear the voice of my shepherd because that means that the shepherd is nearby and is watching over me. But, actually… I’m not always, always happy to hear my shepherd’s voice. Me: Really? Why wouldn’t you be happy to hear the shepherd’s voice? Me: But that’s a good thing, isn’t it? You don’t want to fall off of a cliff. Baabara: I’m sure I would have seen the cliff in time. Me: Maybe not. It’s the shepherd’s job to keep the sheep safe. Baabara: But sometimes that shepherd can be bossy. Like in the morning, she sometimes says, “No you cannot have candy bars for breakfast… you have to have fresh green grass.” I mean who eats fresh green grass for breakfast nowadays? Me: Ummm… sheep do. Grass is healthy food for sheep, so the shepherd makes sure that’s what they eat. It’s good to have healthy food. You don’t often hear about sheep getting diabetes or heart disease or cancer, do you? Baabara: Ok; you’ve got a point there. I’m listening. 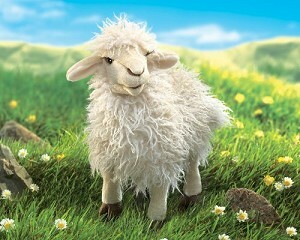 This Easter, I will eat grass and flowers, ‘cause that’s what’s good for sheep… and maybe just one chocolate egg. Me: You are a good listener, Baabara. We humans don’t always listen. I think humans have some of the same problems as sheep. Baabara: Really? You get all of your wool sheared off in the Spring before it really warms up enough? Brrr. Don’t you hate it when that happens? And you feel so naked. Me: No, humans don’t get sheared. But we sometimes don’t listen to the voice of our Shepherd. The disciples didn’t listen when Jesus told them that he would die on the cross and then be raised up to life again. When Jesus died on Good Friday, they were heartbroken and thought that they would never see him again. Baabara: That must have been terrible! Me: But then Jesus came back to life on Easter Sunday and the disciples were overjoyed! They were so happy to see their friend and their Lord alive again. Baabara: But why did Jesus have to die in the first place? Me: Well, if the disciples had listened carefully, they would have understood that Jesus was going to die on the cross to save the world from sin and death. By dying on the cross, Jesus, the Good Shepherd, was saying something very important to the whole world. Baabara: What was he saying? Me: That is very insightful. Sometimes we don’t recognize when people are telling us, “I love you.” Sometimes we don’t hear God telling us, “I love you.” We need to listen closely. That’s the message of Easter. God loves the world so much that he sends his only son to die for us to save us from sin and death. Me: You’re a good listener, Baabara. Thanks for coming to church with me this Sunday. Baabara: Thanks for inviting me. Prayer: Dear Jesus, Thank you for being our Good Shepherd. Help us to listen to your voice and to hear the many times every day that you say to us, “I love you.” Amen.